It's been quite a productive week. 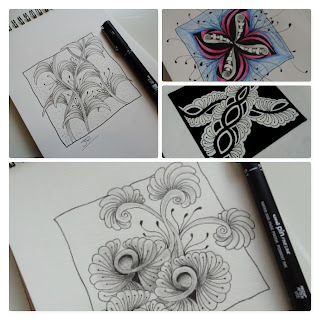 I've managed to keep on track with my daily doodle challenge, and I feel quite positive about the weeks to come. I also think setting myself this goal will improve my drawing skills substantially. I do love drawing. I prefer drawing to painting. I find the thrill of putting pen to paper exhilarating and enthralling. Well, anyway, below is my latest doodle. I was feeling a bit bored when I done this and just started putting lines on the paper. I quite like it. It sometimes surprise me what happens when one just puts lines on paper without any thought for the finished result. It's quite meditative and the results are quite often an unexpected pleasure. I also managed to draw-up a couple of pages for my colouring book, which I hope to publish later this year and I've decided to show one of them, too. Have a great PPF and have a wonderful weekend. Your drawings are delicious and beautiful. I'm sure you did joy doing them. Hi, sirkkis. Thank you for commenting and yes, I had lots of enjoyment. Specially this organic deep black tangle is amazing and good luck and fun with the coloring book project! Happy weekend! Thank you, Susi, for your kind words. Wow you have been so productive! Gorgeous work! I love that you too were just playing and out came that beautiful line work! It's almost meditative when that happens! Well done! Your colouring book will be fabulous I'm sure! Thanks for sharing! Hi, Giggles. Thank you for commenting. It's fun to just play around sometimes. 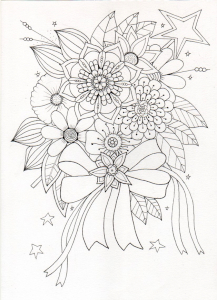 It will be a fabulous colouring book! Thank you, Christine. I hope so. Beautiful and intricate drawings, John. I was thinking to suggest making a book when I noticed that that is exactly what you plan to do. Hi, Faye, and thank you. I've been thinking about a book for a while. Just a question of getting motivated and a bit more confidence in my drawing. das sind alles schöne doodles Zeichnungen,es macht dir viel Spass! Hi, Elke. Thank you for commenting. Yes, doodling is a lot of fun. Thank you, Sal. Glad you like them. I like the dark image best. I think the dark against light creates a lot of contrast. Love the doodles, and I love that you enjoy creating them. Thank you, Sandee. Oh, I just love drawing. I could draw all day if I had the time. Thank you, Latane, for your kind comment. Your drawings are just amazing. I love seeing all the fine detail and knowing the time you put into it. I can also see the thrill you have in doing it. Hi, Nicole. Thank you for your comment. Sometimes they do take a while, but times passes quickly when one is having fun. How fun you just started this by putting lines on paper. It's looking very complicated. And beautiful. 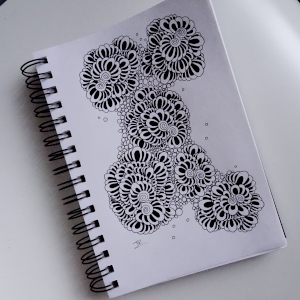 It's a long time since I doodled, but I remember how meditative it was. Great work for your colouring book too! Hi, denthe, and thank you for commenting. I do find find doodling meditative and in today's fast-paced world it's just what I need to slow down. Hi, Courtney. Thank you for dropping by and for commenting. Drawing is a great way to relax. Some folk reckon I'm way too relaxed, but I like being laid back. I think doing so much drawing makes me more chilled.